Keep your tire inflation pressuresat the proper level. The recommended cold tire inflationpressures, tire sizes and the combinedweight of occupants and cargo(vehicle capacity weight) are describedon pages 430 and 434. Theyare also described on the tire andloading information label as shown. You should check the tire inflationpressure every two weeks, or at leastonce a month. And do not forget thespare! The pressure should bechecked only when the tires arecold. If your vehicle has beenparked for at least 3 hours and hasnot been driven for more than 1.5km or 1 mile since, you will getan accurate cold tire inflation pressurereading. Always use a tire inflation pressuregauge. The appearance ofa tire can be misleading. Besides,tire inflation pressures that areeven just a few pounds off can degraderide and handling. Take special care when addingair to the compact spare tire.The smaller tire size can gainpressure very quickly. Add compressedair in small quantities andcheck the pressure often until itreaches the specified pressure. Do not bleed or reduce tireinflation pressure after driving.It is normal for the tire inflationpressure to be higher after driving. Never exceed the vehicle capacityweight. Passenger and luggageweight should be located sothat the vehicle is balanced. 2. Press the tip of the tire inflationpressure gauge to the tire valve. 3. Read the pressure using the graduationsof the gauge. 4. In case the tire inflation pressureis not within the prescribed range,insert the compressed air from thevalve. In case of applying too muchair, press the center of the valveand release the air to adjust. 5. After completing the tire inflationpressure measurement and adjustment,apply soapy water to thevalve and check for leakage. 6. 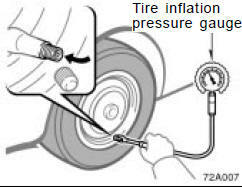 Install the tire valve cap.If a gauge and air pump are not available,have your vehicle checked byyour Toyota dealer. Be sure to reinstall the tire valvecaps. Without the valve caps, dirtor moisture could get into thevalve core and cause air leakage.If the caps have been lost, havenew ones put on as soon as possible.Incorrect tire inflation pressuremay waste fuel, reduce the comfortof driving, reduce tire life andmake your vehicle less safe todrive. If a tire frequently needs refilling,have it checked by your Toyota dealer. Keep your tires properly inflated.Otherwise, the following conditionsmay occur and cause an accidentresulting in death or seriousinjuries.